The oxtail consommé was as dark and rich as a night on the moors, filled with chunks of an ox’s lower half and local root vegetables. The other five courses included an intermezzo of violet and cassis sorbet; filet mignon and lobster Wellington with pear-shaped pommes William; house-grown baby carrots and truffle demi-glace; and a classic Charlotte Russe. If it sounds like a meal fit for the Crawleys of British period drama “Downton Abbey,” that was precisely the aim of Shawn Calley, executive chef at the Essex Culinary Resort & Spa. He’d prepared this preview dinner to show members of the press and donors what to expect at an upcoming opulent event at the Essex. Manchester resident Ellenbogen and his wife, Carolina, have teamed up with Chuck Bongiorno, VPT’s major-gifts director, and his team to design this fundraiser unlike any previously staged in Vermont. While it won’t be cheap, the event has attracted interest from deep-pocketed “Downton Abbey” fans well beyond VPT’s viewing area. The Ellenbogens — Michael is a filmmaker, Carolina a painter — incorporated as Eons Creative in the fall of 2011, just after the newlyweds settled in southern Vermont. Michael, a University of Vermont grad, had worked in the motion-picture industry in New York City for 20 years; one of his jobs involved distribution strategy for the 2001 film Gosford Park, which was scripted by Julian Fellowes, future creator of “Downton Abbey.” But in the past decade Michael Ellenbogen expanded into another sector of entertainment — what he calls experiential marketing. That means marketing through grand, immersive events of the sort most of us only see when Donald Trump’s charges create them on NBC’s “The Apprentice.” But Eons Creative may upstage even the Donald with its plush plans to raise funds for VPT. Ellenbogen first connected with Bongiorno when he sought permission to show episodes of “Downton Abbey” to preview an event he was considering staging at the Wilburton Inn in Manchester Village. That quickly morphed into the idea of a gala to create buzz about the American premiere of the much-anticipated third season of the historical soap opera. 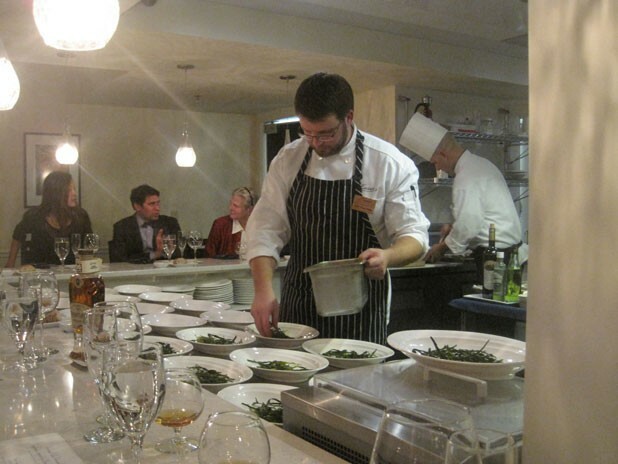 Ellenbogen was fresh off his first Vermont event, a February 2012 Oscar party that combined red-carpet dress and pomp with a culinary competition called the HotChocolate Society. He produced his first chocolate-focused cooking contest by that name in New York City in 2009. “One aspect of the experience is to introduce people to fine chocolates,” Ellenbogen says. HotChocolate Society competitions include savory chocolate-based dishes, too. In Manchester, chefs donated entries in both sweet and savory categories to benefit the local Meals on Wheels and were awarded prizes in both, as well as an audience award. Attendees competed for their own prizes for the most Oscar-glam outfits. Ellenbogen hopes to expand his line of chichi culinary competitions around the state, but the “Downton Abbey” event is more than one gut-busting meal. When VPT, Eons and the Essex began talks, the idea was simply to pass hors d’oeuvres at a screening at the Essex Cinemas on January 5, a day before anyone else in North America would see Episode 1 of Season 3. That plan grew to include a six-course plated dinner, a vintage farmers market supplied with small bites and a second day of events, including a cooking demonstration of period dishes and Sunday brunch. So thorough is the Downton dining experience, Toronto blogger Pamela Foster will attend and give a talk entitled “Great Food Has a History.” Foster’s website, downtonabbeycooks.com, is known as ground zero for aficionados when they seek information about the teas and beef Wellingtons served on the series. Not everyone who buys one of the 900 tickets to the event will get a taste of every option. Ellenbogen, along with VPT and Jim Glanville, vice president and general manager of the Essex, are planning an unabashedly luxurious event. Only couples who donate in the $625 “Diamond” range or higher will partake of every meal. (Ticket prices for two go up to $1500, the “Earls & Countesses” stratum.) A cocktail reception, gift bag and a pair of tickets to the screening at the Essex Cinemas’ T-Rex theater — where viewers will hear Downton’s kitchen bells clang on 124 speakers — will set a couple back $140. Are the buyers going for high-roller donations — which include an overnight at the Essex and a private footman — or more modest deals? So far, Bongiorno says, they’re split about 50/50. As long as “Downton” fans are shelling out, they may as well go for the $225 “Ruby” level. That second-from-bottom tier grants them access to the Arcade & Culinary Experience, set in the Essex’s large atrium where weddings and special buffets take place. And it promises to be an experience, indeed. Students from Champlain College are creating sound bridges for each room to provide a hint of “Downton Abbey” everywhere guests walk, complete with the noise of cars and horses driving up at the entrance and the din from the kitchen and its population of scullery maids. UVM scenic designer and professor Jeffrey Modereger and his students will transform the atrium into a bustling downtown in rustic 1920s Yorkshire. Calley, who is planning each menu with the help of food and beverage director Arnd Sievers, has created small bites to fill re-creations of period shops. The vegetable sellers will serve cold salads and miniature patties of fried, chopped veggies traditionally known as Bubble and Squeak. House charcuterie will populate the butcher shop, while a Russian fish pie known as salmon coulibiac will be among the offerings from the fishmonger. Some of the food will be donated. King Arthur Flour has agreed to supply Calley and his executive pastry chef, Perrin Williams, with all the flour necessary for their savory en-croûte dishes, as well as for the English-style dessert puddings, homemade breads and croissants that will fill the arcade bake shop. Calley is also hoping to hear from a local cheesemaker about supplying the cheese shop. The fundraiser will have nonfoodie facets, too. Guests will dress to impress for a period fashion competition judged by historical textile expert Karen Augusta. UVM students will give presentations on specific historical aspects of the television show. The National Gardening Association is donating flowers for period displays. And, to ensure that lords and ladies know how to behave at a formal function, Anna Post of the Emily Post Institute will teach etiquette lessons and test guests on whether they know which one is really the salad fork. Even if the funds raised don’t meet VPT’s expectations, a heightened blogging and social-media buzz around the event is sure to win the station potential donors. A month and a half before VPT’s Experience, its own Facebook page had 134 likes. According to Bongiorno, the event’s Twitter account has also been “extremely active” with between 15 and 20 messages each day. Though he’s not ready to reveal what’s next for Eons Creative after the 2013 HotChocolate Society competition, Ellenbogen has a hint: It will revolve around a “green” concept, with food, music and “a lot of exercise.” Perhaps the event will attract those to the manor born and the help alike.